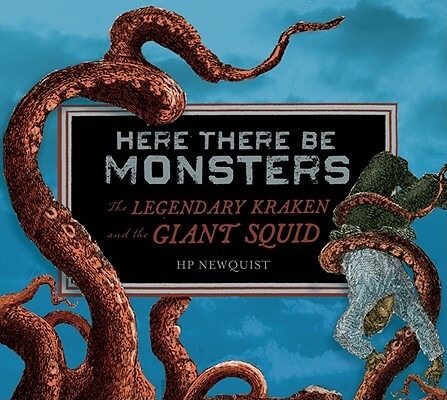 Here There Be Monsters: The Legendary Kraken and the Giant Squid by HP Newquist. (Grades 4-8.) Houghton Mifflin Harcourt, August 2010. 74 pages. Review copy provided by publisher. There is silence for a moment. Then it happens again. The boat shudders. But this time, the deck under your feet tips downward. It feels like something is grabbing the ship and trying to pull it into the water. You run to the side and look over the railing, but you can't see anything. There is nothing to light the waves; the moon has slipped behind a cloud. Then, through the inky blackness, you see something rise up from the rippling sea. It is ghostly and round, and it gets brighter as it nears the water's surface. For hundreds of years, people believed (or scoffed at) legends of a mysterious sea creature called a kraken. Sailors told tales of this gigantic beast attacking their ship, nearly pulling them under with enormous tentacled arms. People thought it was a myth, a legend, until some scientists thought, "What if it's not a myth?" They started doing research, people like Erik Ludwig Pontoppidan who interviewed sailors for their descriptions of the beast and Pierre Denys de Montifort who included a drawing of a "gigantic octopus-like creature" in a book about mollusks. As science and exploration became more popular in the mid-1800s, scientists began looking for evidence of the kraken. And, eventually, they found it. Here They Be Monsters examines the history of the search for the giant squid and the larger, more aggressive colossal squid. It starts with the legends and myths told about the beasts and describes the predictions made and evidence found by scientists as they searched the deep seas. In 2004, the first undersea pictures of a giant squid were taken by Japanese scientists. And in 2007, a New Zealand fishing boat crew caught a colossal squid while reeling in their fishing lines. This remains the only full-grown specimen to be caught. This book would be a great choice for research and assignments. It's very thorough, providing lots of information about a creature that we don't (yet) know a whole lot about. The narrative is very readable, but the large blocks of text without photos or illustrations to break them up might deter recreational readers unless they have a particular interest in the topic. Considering how few photos exist of the giant and colossal squids, it's understandable. HP Newquist includes a note about the availability of photos, saying "Fewer than a dozen giant and solossal squid have ever been photographed or filmed alive in the ocean. Almost every picture ever taken of living specimens is included in this book." Also included are a bibliography, resources for further research, photo credits, and an index. I'm not exactly an expert on squids, but it's hard to imagine a better resource for anyone wanting to learn about giant squids. Happy Nonfiction Monday! Check out this week's roundup at Picture Book of the Day!